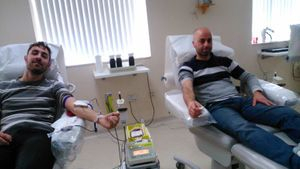 It's the only donation you can make where you give a part of yourself; and that to save lives, literally. or call 22066201 or 79307307. Go on - 15 minutes can make you a hero for a lifetime! Picture shows the school's First Aid Clinic, as well as the set of first aid kits we use on outings. Healthy Living Day was another success with AED and first aid demonstrations and practice, zumba classes, archery and slacklining as well as debate sessions. 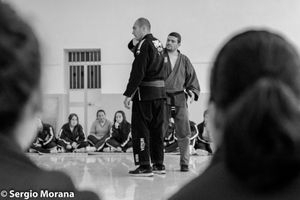 Cold granitas, Hot cardio exercises and Quick thinking in self defence - This is what characterised Healthy Living Day at Our Lady Immaculate School this year. In addition, the students attended awareness sessions about sun protection, Maltese flora and fauna, healthy eating, etc. Healthy Living Day (10th May) started and ended with a bang as scores of students attended the Health Check sessions being held in the school's computer lab.There they had their BMI calculated, their Pulse and Oxygen Saturation levels read, their Blood Pressure measured and other medical information recorded. Many commented this was a learning experience since it involved their own parameters and could be guided as how to live healthily. Many teachers and other school staff also paid a visit and availed themselves of the free health checks being offered. Thanks to all the ones that helped make this happen. Another health related breakthrough happened at school today when Our Lady Immaculate School was awarded the Green Flag, thanks to the hard work of the school's Eco Skola Council. A healthy environment is safer to live in and gives way to healthier lifestyles. 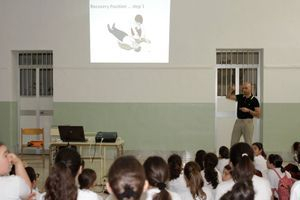 The dental hygiene talk by Dr Zammit, Zumba sessions, anti-bullying and substance abuse talks as well as the Smoochie sessions all contributed to a week of useful lessons for life. Staff Basic First Aid In-Service Training. A group of 13 teachers, learning support assistants and an assistant head participated in an interactive basic first aid course organised in-house. The participants followed this course on a voluntary basis and all members were very keen on improving their first aid skills. Well done to all! 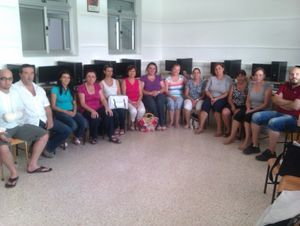 and last but not least the parents and guests who visited the school. Health and Safety Awareness lessons in Risks, First Aid, Online Safety and Emergency Evacuation. Launch of this H&S school website; healthy lunch (fruit, cereal, water); CPR and Choking First Aid training; Red Cross ambulance display; traffic safety, substance abuse, energy conservation and healthy eating talks, fun games, mobile blood unit, anti-bullying stage performance, etc.